What foundation am I building my life on? What is my game plan to win in life and build my legacy? Transformed leads men to build the strongest foundation possible. Whether building a house or stronger muscles, the effort requires time, energy, and a plan. 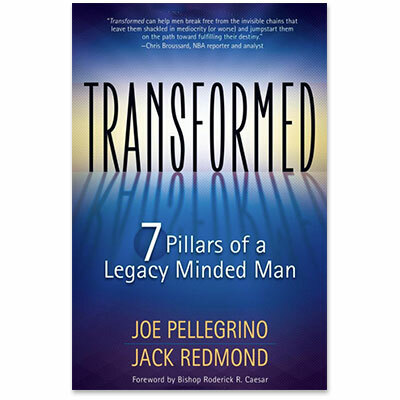 Transformed provides a 7-step game plan that will help men win in life and build a strong legacy for generations to come. Prayer strengthens your relationship with God. Persona (who you really are) is discovered through relationship. Purity maintains unbroken relationship with God as your leader. Purpose is discovered under God’s leadership. Priorities bring focus to live your purpose. Perseverance pushes you to never give up. Power is unleashed as you live out the first 6 pillars. JOE PELLEGRINO is the founder and president of Legacy Minded Men, publisher of Life & Leisure, LLC, and president of Not Just an Average Joe, LLC, a unique marketing company. Joe and his wife, Bethanne, have three children and reside in northern New Jersey.